III-5 Question: The Dalai clique and some Western media have often said that China built the railway link to Tibet mainly to plunder the region of its mineral resources. What is China's response to this? Who, the Han people or the Tibetans, will benefit most from this railway? A: This criticism has been heard overseas frequently. It is a reasonless proposition that results from a fallacy that "Tibet is not part of China," which the Dalai clique has been spreading for many years. The Chinese people are developing resources on their own land, so how can China be accused of "plundering" its own resources? All countries in the world, including the United States and Germany, build railways for economic development. China is no exception. Moreover, other parts of China have already had their railways. Tibet is part of China, and building railways to benefit local people is perfectly justified. Western media's denouncement stems from their bias for "an independent Tibet," and that's why they have reached such a ridiculous conclusion. The Tibet Autonomous Region covers about one eighth of China's territory. Of its 2.8-million population, Tibetans account for more than 90 percent. But the economic development of Tibet, previously the only provincial-level region inaccessible by railway, had been largely handicapped by poor transportation facilities. After China initiated its reform and opening policy in 1978, Tibet, like other parts of China, began to conduct reforms in various fields and achieved much progress. But compared to the eastern coastal areas, Tibet still lags far behind in terms of market awareness and market mechanism building. The opening of the Qinghai-Tibet Railway will break the region's long-time seclusion, make travel to the hinterland easier and ensure a smoother flow of people, goods and information. In addition, the geographic advantage of Tibet linking to South Asia will become more prominent. All these factors will lay a good foundation for Tibet's faster growth. There is no doubt that the direct beneficiary of the Qinghai-Tibet Railway will be the Tibetans. Firstly, the cost of living will be reduced by a large margin. For example, prices of building materials and consumer goods, such as the cement for home building and electric appliances, will drop sharply. 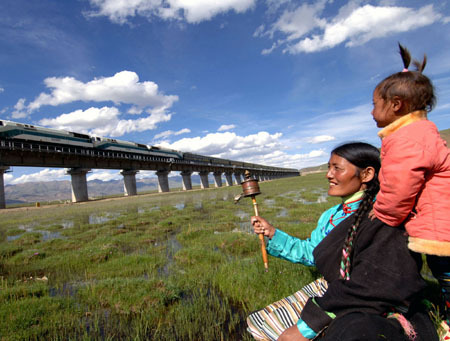 Secondly, the railway will bring new chances for Tibetans to develop their ethnic industries, and with enhanced market awareness, they will get more involved in the national market economy. In addition, Tibetan is an ethnic group good at learning from and blending with advanced cultures. Besides economic benefits, the railway link will help facilitate more development and better inheritance of Tibetan culture.